Both teams entered Saturday night’s play coming off a win as Seattle beat Spokane 5-1 and the Everett Silvertips knocked-off the Tri City Americans 3-2. 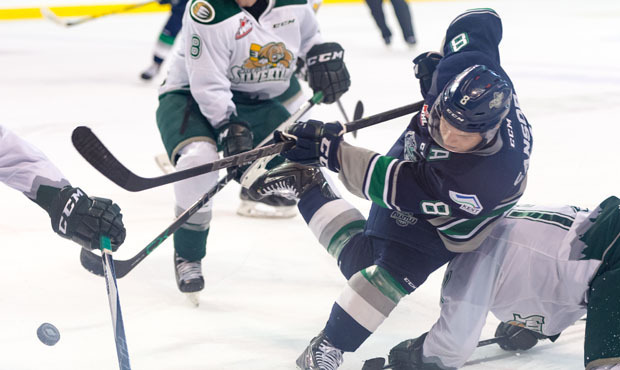 Unfortunately it was the Silvertips that extend their victory streak as Everett came from behind and cruised to a 4-1 victory Saturday night ending Seattle’s perfect home regulation victory streak. Everett (17-10-0-2) started off the opening period with a much faster pace in mind than Seattle (18-10-2-0), out-shooting them 6-2 in the opening few minutes. Despite Seattle’s low amount of shots, W opened the scoring for the Thunderbirds with an even strength goal at 12:44, assisted by Ryan Gropp and Ethan Bear. A couple of minutes later, Seattle would be afforded a power play opportunity when Brycen Martin got called for hooking at 16:27, although Seattle was not able to convert. Following that, Jamal Watson was sent to the box for Seattle at 19:03 for cross-checking. The Thunderbirds would head to the locker room holding a 1-0 lead, with the Silvertips having 1:03 remaining of powerplay time to start the second period. Shots were 16-7 in favor of Everett. A game of “cat and mouse” was played between both teams for the opening half of the second period as few shots were put on either goal. But only a few seconds after the mid-way point, Jared Hauf and Spencer Gerth would drop the gloves and take 5 minutes each for fighting, with Hauf taking Gerth to the ice. Late in the period, Patrick Bajkov would tie things up with an even strength goal for Everett, scoring at 16:29. Shots were 25-20, still in favor of the Tips. Everett dominated the final period of the night, starting with Remi Laurencelle scoring for the Tips just 0:44 seconds in to make it his 15th goal of the season. At 7:44 of the final period Jerret Smith would head to the box for the Birds, allowing Everett’s Cole Macdonald to cash in on the powerplay and increase their lead to 2 with only about 10 minutes remaining in the game. But, Everett still hadn’t had enough, with Bajkov scoring once again just two minutes after that last goal on a breakaway from a poor mistake by Seattle to increase their lead to 4-1, and they would hold onto that score to take the win Saturday night. Everett handed the T-Birds their first regulation loss on home ice this season, and they now lead the series 2-0, beating Seattle at Xfinity Arena in Everett back on October 24 by a final score of 2-0. Unfortunately, the player of the game tonight had to be the Everett Silvertip’s Patrick Barkov. Bajkov scored two of Everett’s four goals Saturday night. One of which broke the tie game and the other gave Everett some extra insurance to pull out a 4-1 victory. Seattle is back at it Tuesday night for a Director’s Mortgage “Two for Tuesday” game, as well as “Star Wars” night. Game time is at 7:05, at Showare Center, in Kent, WA. Seattle welcomes the visiting Prince George Cougars who are coming off of a 3-2 win over the Portland Winterhawks Saturday night. Have your own prediction or comment on the game? Join the SSU community, leave a comment below and like us on Facebook. Follow us during the game @SeattleSportsU on Twitter and watch us Sundays at 8:00pm (PST) on YouTube, as we discuss this game and all things Seattle sports. Matt Paige is the Baseball Managing Editor and a regular contributor on SSU TV and for Seahawks Football. He also writes the column "The Call-Up" and is a rabid fan of all teams Seattle (Except the Huskies. Go Ducks! ).